We did it. After 5 long years of unrelenting community, political and legal pressure, every child seeking asylum has finally been removed from Nauru. But the fight isn’t over. Hundreds of men and woman still detained in offshore processing on Nauru and Manus Island urgently require medical care and must also be brought to Australia for immediate treatment. This year the political environment is primed for change. So today, as parliament reopens we will be there. We are taking a stand for the fair treatment for people seeking asylum. The amendments to the Home Affairs Bill are due to be voted on when parliament resumes. Before 2018 came to a close, our movement, a coalition of doctors, refugee and humanitarian organisations made great strides towards treatment for critically ill people in offshore detention. Your voices were heard and this fierce, compassionate and just community that you are a part of came together to see the Senate pass the Urgent Medical Treatment Bill. However, our step toward safety and medical treatment for people on Manus and Nauru was brought to a grinding halt. The Prime Minister shut down Parliament early to stop Labor and the crossbench getting Urgent Medical Treatment amendments through. Once again human rights are being used as a political pawn. Doctors across Australia have been incredibly clear. If those left languishing on Manus and Nauru are not transferred to Australia for urgent medical treatment we will lose another life. Right now the ASRC’s CEO Kon Karapanagiotidis and director of Advocacy and Campaigns, Jana Favero are in the corridors of Parliament to ensure your voices and the professional opinions of over 7,000 medical professionals are heard. 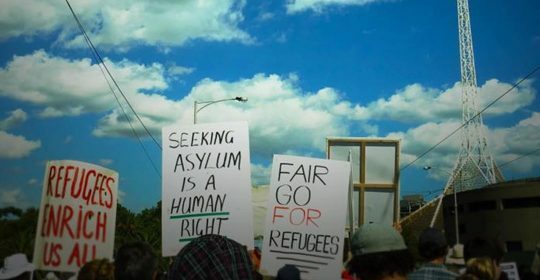 Together, with the ASRC’s Campaigns and Detention Advocacy teams, we will continue to hold the Government accountable for its policies that vilify people seeking asylum. Your support helps us remain independent, shine a spotlight on the cruel treatment of people in offshore detention, and have challenging conversations in Canberra with the people who have the power to enforce change. Together we’ve been building a movement. and access to work rights, study rights, Medicare and income support for people seeking asylum. Our ideal future is one in which Government policies no longer dehumanise people seeking asylum. So, please join us and help power the movement by donating today.